The Buckstop Single Wheel Conversion is an engineered kit with each component integrated to acheive as close to OEM structure as possible while converting from dual rear wheels to four single tires. The purpose of the Conversion is for greater off-road traction and performance without compromising weight carrying capacity. At the core of the kit are 41" tires with 6700 pound capacity each. Clearance for the big tires is achieved with a small suspension lift and large cut-out fender flares to keep the center of gravity as low as possible. The wheels are reversible and interchangeable front to rear for proper tire rotation. Track width is roughly 89" at the outside and consistent front to rear. Fender Flares are an itegral part of the kit providing complete tire coverage from road spray and also replacing and covering parts of the body that are cut away for tire clearance. 41” tires and 10,000lb payload are the fundamental elements of the Single Wheel Conversion. 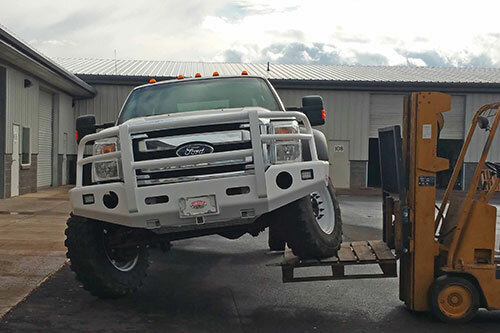 At Buckstop, the chassis is fully loaded with 10,000 lbs and subjected to extreme articulation and turning conditions to determine suspension and body modifications required for tire clearance. 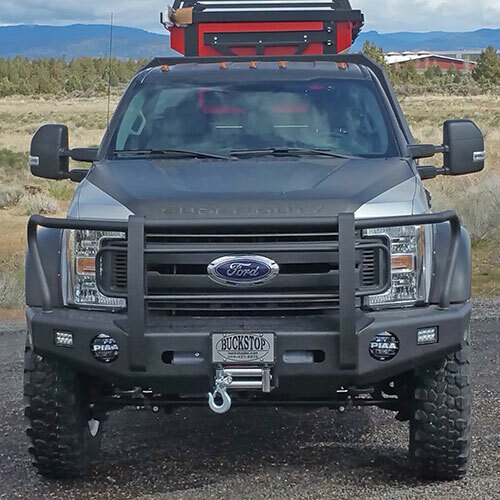 Key components of the Buckstop Suspension Kit are Heavy Duty replacement front Leaf Springs, Heavy-duty Track Bar Mount, and shock absorbers. These pieces maintain proper, original steering geometry. INCLUDED WITH BASE KIT. In order to neatly fit the monster 41” tires under the body, the fender and body require cutting and trimming. 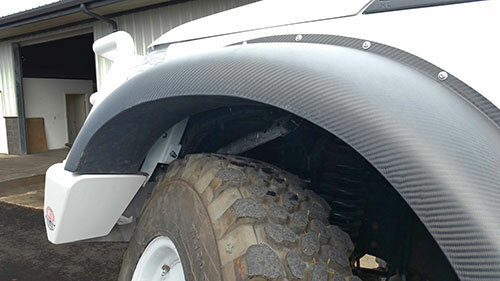 Extra wide fender flares are a special part of the puzzle that cover the cut-out portions of the body and also cover the tire from road spray. The flare is a one-piece design including a return inner wheel liner that integrates with the OE liner. INCLUDED WITH BASE KIT. Tires: With a 19,500lb GVW, rear axle capacities approach 14,000lbs requiring a tire capacity up to 7,000lbs each. The 335/80R20 is the perfect choice - a “military” style radial tire with excellent handling characteristics under load. It has an off-road tread pattern and can be aired down to match different loads. Tire noise is acceptable at a level equivalent to a standard truck mud tire. Wheels: The military tire has a higher shoulder than light-truck street tire. A typical street, light-truck wheel will not fit the tire properly and carry the weight. Buckstop manufactures wheels that are designed for the load and the military tire. They track in-line front to rear compensating for the difference in front and rear axle widths of dually trucks. The wheel is single piece construction without extra bolt flanges, spacers, and bolts. Weight capacity is acheived through a heavy-duty rim made from ¼” thick material. Tires can easily be rotated front to rear for even wear without dismounting the tire from the rim. 5 WHEELS AND TIRES ARE INCLUDED WITH BASE KIT. 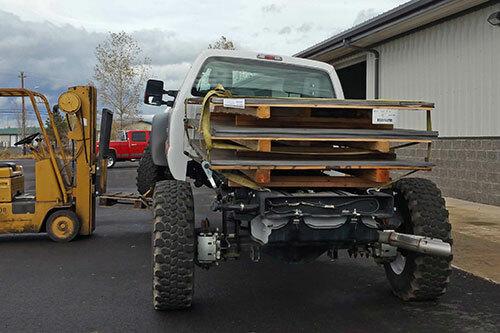 Topping off the truck is an extra-wide bumper compensating the increase in front track width. The bumper extends past the fender flares to fend off fence posts, trees, and other obstacles jumping out along the way. At the heart of the bumper are the same features found on standard Buckstop bumpers including winch mount, tow hooks or mount points, trailer receiver, latching winch access door, built-in light mounts, and several options for built-in sirens, speakers, and monitor. INCLUDED WITH BASE KIT. Undercarriage protection is available for the Radiator designed to keep branches and debris from damaging the underside of the vehicle. These pieces are heavy-duty construction and fit tightly to the underside with minimal loss of ground clearance. These pieces are not included with the base kit.